Introducing the “Joker’s Wild” Charity Poker Tournament. This fun social night is for adults, 21 yrs and older, hosted by 3ON3 Elmhurst and our friends at the Knights of Columbus on York Rd in Elmhurst. Don’t miss it, Saturday, February 10, 2018. Click the Register Now button to complete your online entry and donation. Online registration is required. Deep in the DNA of “why” 3ON3 Elmhurst exists traces back to the generous and remarkable people at the Shirley Ryan AbilityLab (formerly Rehabilitation Institute of Chicago). Trish Williams, wife of the founder of 3ON3 Elmhurst benefited in ways it is not possible to express in words from her time in their care. With the Williams family funds nearly depleted, health insurance plans completely maxed out, and her difficult recovery seemingly stalled, the Shirley Ryan AbilityLab took her in. And from there, it was history. She made amazing strides in recovery almost daily with their breakthrough techniques and the highly skilled team of doctors, therapists, and nurses. Trish, as many of you know, is now fully recovered, back at work, and enjoying a normal life with her beautiful family of four children. Without this world-class team right here in Chicago, it is likely Trish would not be enjoying the life she is today. For this reason, 3ON3 Elmhurst exists – to give back – and clearly, the Shirley Ryan AbilityLab is #1 in our hearts. This is a debt of gratitude for selflessly giving Trish her life back, as they do so many patients every day. While their situations may vary, we are certain a good number of AbilityLab patients are also in a similar financial and health situation right now, and we want to pay it forward by donating AS MUCH AS WE CAN to this amazing institution. 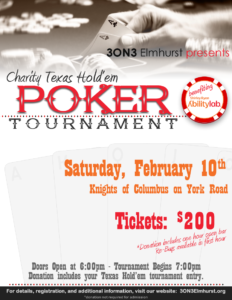 Your participation in the Poker Night will make a big donation possible in 2018. Food is generously being provided by our friends at Pints. 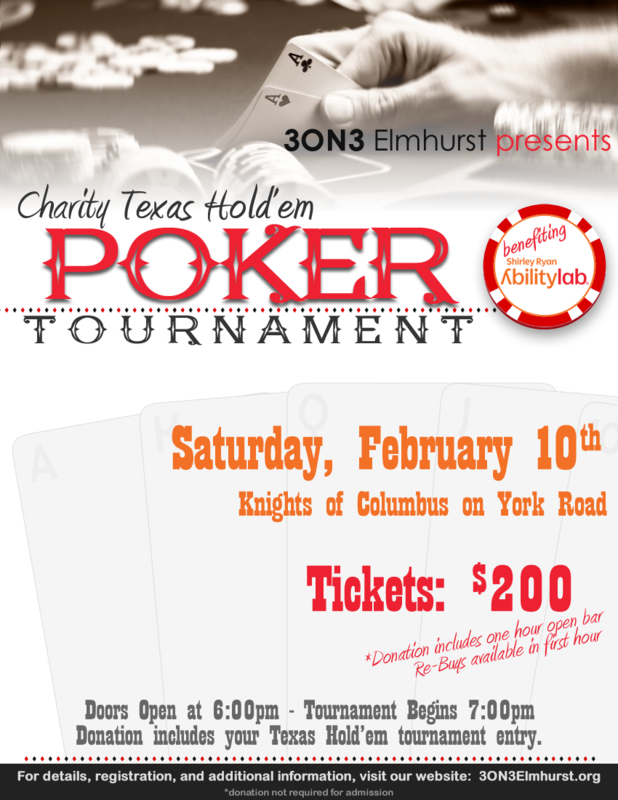 If you cannot join the poker party, but you wish to donate, please click here.